We are delighted to officially launch EAGLES TV in conjunction with The Speedway Portal. The launch edition comprises of a 20 minute clip focusing on The Fans Forum held on Sunday 3rd February and includes interviews with Jon Cook and Trevor Geer. EAGLES TV provides us with a completely new and exciting Media Portal to share News, Updates; Documentaries; Fans Q/A; Rider and Management interviews and a whole lot more, with not only Eastbourne Eagles Supporters but Speedway and non-Speedway fans nationally and globally. There are strict rules governing the broadcast of Speedway Matches in the UK and as such EAGLES TV is limited to no more than 2 minutes from 3 races at each Speedway meeting at Arlington. EAGLES TV is therefore to be seen as being “in conjunction” with the DVD’s that will be available in the online Store on the Website and at the Track Shop of every Eastbourne Fineprint Eagles Home Meeting. All Home matches in 2019 will be filmed and available from T2TV. T2TV will work closely with EAGLES TV to produce some of the EAGLES TV output. All EAGLES TV Content however will be EXCLUSIVE and dedicated to Eastbourne Fineprint Eagles. We would like to say a BIG THANK YOU to ReRun Productions who have filmed racing at Arlington for many years. The decision to change to T2TV was purely logistical, based on our desire to have the ability to film and record material locally and at the Stadium on a 7 days a week basis. We thank Steve at ReRun for all of his help and support and Supporters will be delighted to know that many Rerun Production DVD’s will remain available on sale, at our Club Shop and on the ReRun site for the 2018 season (including a superb Season Highlights Package) and for previous seasons. EAGLES TV and the EAGLES TV Home Page on the Eagles website will give us huge scope to attract NEW Advertisers too and we can arrange Speedway / Advertiser / Sponsor related bespoke Marketing and Documentary material on request. We also plan to use EAGLES TV to highlight our Community work along with other, previously unseen footage. There are access points to EAGLES TV across a number of pages on the website and they click right through in to some great current and archived material. Make sure that you keep an eye out for our EAGLES TV Film and Production Crew too around the Stadium before, during and after racing, as we hope to interact with and to speak to as many of you as possible in the coming season. If you have an idea for an item for EAGLES TV, fancy giving us your views on Speedway or related topics, or are an Advertiser or Sponsor seeking a wide coverage and big audience, please feel free to contact us at any time. We will be filming before and up to PRESS + PRACTICE DAY including updates from all of the 2019 Eastbourne Eagles Riders, Management; Sponsors and Supporters so watch this space! 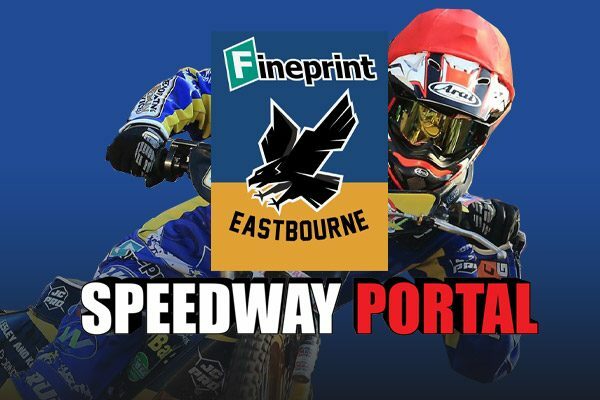 In the meantime, along with the Fans Forum, there are a few hours of Eastbourne Eagles related material loaded up and ready to view as we can’t wait for the new season to begin. We hope that you will dive in and enjoy. We have been asked by a previous Sponsor to remove any Logos and Images where possible which show Forman IT; so you may spot some blanked out images on the 2018 Archive; this is beyond our Control, or that of The Speedway Portal. We have done our utmost to comply with the request, whilst maintaining the integrity of the action and information, which we believe all Eastbourne Speedway Fans deserve to see.